The Grand Canyon University Canyon Chorale, seen here at its Masterworks Concert in 2017, will perform traditional hymns and African-American spirituals at this year’s Masterworks Concert on Thursday at First Southern Baptist Church. Grand Canyon University’s vocalists are accustomed to hitting those high notes. But they will be hitting an even higher note this spring when they make their debut at the famed Carnegie Hall in New York. They will perform there under the direction of Dr. Juan de Dios Hernandez, assistant dean of music in the College of Fine Arts and Production, on April 23 with the New England Symphonic Ensemble. 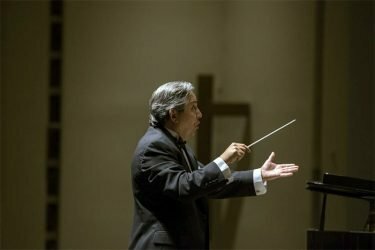 “This is the first time in the history of our University that we’ll be performing at Carnegie Hall,” said Hernandez, who was invited to conduct and extended the invitation to GCU’s choirs. 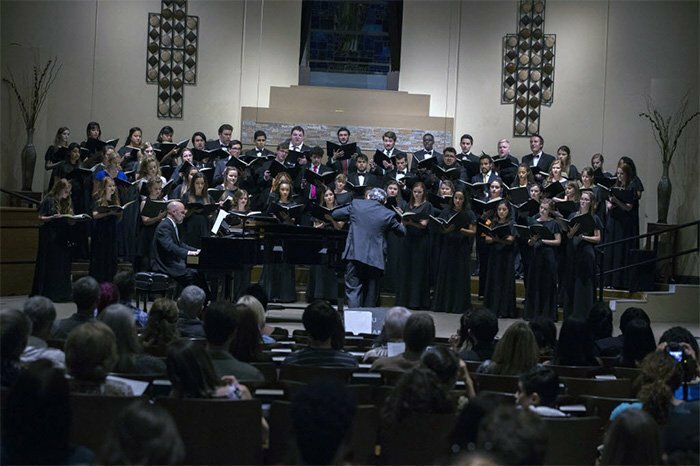 Students have been raising funds for the past several months to support the trip to Carnegie Hall and will do so again at the GCU Choirs’ Masterworks Concert at 7 p.m. Thursday at First Southern Baptist Church of Phoenix. Admission to the concert is free, though donations will be accepted. 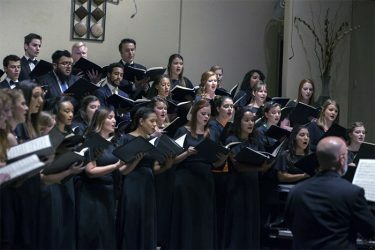 The “Night of the Soul” concert, part of the Ethington Music Series, will feature the 40-member GCU Canyon Chorale, the 14-member Critical Mass vocal ensemble, and student and faculty soloists. Dr. Juan de Dios Hernandez conducts the University’s choral groups. Despite all the negative headlines, Hernandez said comfort and faith can be found in music. “We try to integrate faith into our music,” he said, and concert attendees will feel that at Thursday’s concert. Included in the repertoire will be hymn arrangements, such as the Reformation hymn “A Mighty Fortress Is Our God,” a fitting choice since last year marked the 500th anniversary of the Protestant Reformation. It was on Oct. 31, 1517, that Martin Luther nailed what would become known as his 95 Theses to the doors of Wittenberg Castle church in what is now Germany. According to the theologian, Christians could not buy or earn their way into heaven; they could only enter heaven by the grace of God. It was a thought that led to a split with the Roman Catholic Church and the birth of Protestantism. Luther, who was also a hymnodist, wrote “A Mighty Fortress is Our God” between 1527 and 1529. It has become one of the world’s best-known hymns. Another hymn arrangement to be performed will be “And Can It Be That I Should Gain,” written by Charles Wesley in 1738 to celebrate his conversion. “It is Well With my Soul,” a hymn written by Horatio Spafford with composition by Phillip Bliss, also is on the performance list. “Those are beloved, traditional hymn arrangements,” Hernandez said. GCU’s vocalist, performing during the 2017 Masterworks Concert, are preparing for their Carnegie Hall debut in April. “Dark Night of the Soul” is based on a poem by St. John of the Cross, who lived in the 16th century. He added that “Dark Night of the Soul” contrasts “Luminous Night of the Soul” musically and thematically — “‘Dark Night’ is more intense and restless while “Luminous Night of the Soul” is more reflective and speaks about the sovereignty of God. The concert will feature accompanist Mark Fearey, who is on the piano faculty in the music department, and student soloists Carah Robenalt, Jeanette Evins, Kaleb Burris and Melissa Landes. Next up for the choral groups will be the “Broadway, Opera and Beyond” concert March 8 at First Southern Baptist. You can reach GCU senior writer Lana Sweeten-Shults at lana.sweeten-shults@gcu.edu 602-639-7901. Follow her on Twitter @LanaSweetenShul.